Vice Chairman’s report of the Members meeting Thursday 21 March 2019. We had an excellent turn out, rough count 140 including 4 guests. Gail’s Groups Report March 2019 has already been sent to all members by email. Our main speaker, Maria Glot, talked about Saltaire after Titus from 1840 to the present day. As before, she gave a full-on amusing story-telling experience of the characters who drove the Mill through its various phases of boom and bust. The canvas proved broad enough to include many personalities through their loves, desires and all to frequent early or sudden death, curses of Milner’s Field included. 1983 saw the nadir of the mill, with only 123 workers. Some visionary ownership and management then led to its listed building status and the ultimate reward of world heritage site status. A complete account will appear in the local press and on our website next month. For more about her talks, look at the Saltaire experience. Our next meeting will be Thursday 18 April 2019 and our speaker will be by professional photographer, Dr Tony Waltham. He will take us on a photographic tour of the Volcanoes of Italy. His website has recently been hacked, so a link to his work is here. Your committee look forward to perhaps seeing you next month. U3A Todmorden had clearly bargained for 45 minutes from Philip Caine on 21st February, but it got a lifetime’s worth of fluent storytelling (and a chance to buy a book at the end of it). Leaving school at 15 in Barrow usually meant a trip to Vickers-Armstrong and signing up for an apprenticeship. But Philip bucked that for the excitement he’d been having behind his dad’s back – cheffing at a local hotel. After a two-year apprenticeship in the kitchen, a series of jobs in Bowness, Harrogate, London and Paris and some hotel management led to Philip’s indomitable wife, Sandra, suggesting oil rigs. Two weeks on, two weeks off – what wasn’t to like? For both of them! And that led to ten years on rigs in a variety of roles, followed by seven working in logistics for BP in the North Sea. And the same again in Nigeria. Philip’s next big challenge came as the Soviet Union began to disintegrate, and he took a job with Chevron building accommodation for 2000 in a new gasfield in Kazakhstan. Six weeks on, three weeks off and Sandra was still happy. Supply lines were a challenge – 6000 meals a day require a lot of meat. The route from Russia was through bandit territory. If you keep losing $20,000’s worth of meat, you need a new supply route. A certain Russian Colonel Alexei offered his help. He had two business associates in Moscow. They could charter planes. The meat was flown in. And when Alexei wanted his nightclub running, Philip was his man, assisted by bouncers from the local judo club. A nice little earner for the lonely evenings. Then the big gamble. Resign, start a company, borrow money and build two hotels in Astana. A pity it coincided with the crash and Philip was left with $250,000 of debt. But Sandra believed in him. After 2 years working and managing to service his debt, he snapped up a job in Baghdad – building accommodation for 30,000 troops in three months. Complicated security and travel logistics meant the camp was often short of 400 migrant workers for up to eight days. Alexei’s business associates obliged by operating charter flights between Dubai and Baghdad. Changeover gap reduced to 36 hours. Brilliant. In spite of the dangers inherent in this workplace, Philip had paid his debt off in 2 years and finally quit in 2010. After which Sandra got a bite of the cherry and they lived in Dubai while Philip set up companies in Kurdistan. When that got tricky, he closed his company and went home to Barrow. Where he was bored. ‘Write a book about what you’ve done,’ said Sandra. And thus the Jack Castle series was born, all based on a lifetime of experience. Philip Caine makes a sale. And if publishers turn you down? Become your own publisher and enjoy rejecting those same people who gave you the thumbs down. And tell them you’ve a screenplay in development. What a whirlwind of a life! A terrific talk from a most engaging speaker. U3A Todmorden salutes you, Philip Caine! The Chair welcomed everyone to the February meeting. We are delighted to announce that the membership of U3A Todmorden has now reached 519 and we hope the recent recruits enjoy their involvement finding many opportunities to make friends and contribute to stimulating discussions in their new learning ventures. Gill asked the members to join her in thanking and congratulating the Publicity team on the huge amount of work and effort this has taken but it does indeed paint a positive picture of U3A Tod with many good suggestions for the committee to consider. A new webmaster to take the place of Alan McDonald has been appointed. Gill welcomed Teresa Paskiewicz as the newest recruit to the Publicity team and thanked Teresa for stepping forward. A very general over view of the Survey results shows that many members enjoy the monthly meetings and our speakers but then again the bulk of the replies did come from the audience at the May, 10 year celebrations so that isn’t too surprising. Next time we must definitely make sure to encourage those who didn’t attend the meeting to reply too. In the Special Interest Groups section, Gill is taking on board requests referring to Languages by attending the first Language Conference at Aston University next month and in particular is hoping to find out how these groups can function long term without a leader who has specialist knowledge. It is of course part of our ethos that we share the learning task between us but she particularly wants to know useful tips on how you can actually make progress without an expert to guide and correct you, especially in pronunciation! It was also amusing to find out how warmly members regard our association by the fruits, furniture and animals chosen to represent us. Gill tempted members to look more closely at the results but gave as examples the following; an animal? A cheetah because it has lots of interesting spots! A piece of furniture? a 3 legged stool because it is stable and a great support and finally a fruit? A pomegranate because there are lots of things inside one skin / lots of seeds with the potential to grow into something fantastic. The coffee morning for new comers is going to be on Tuesday 9th April, down stairs at Central Methodist from 10.30am to 12 midday. Gill will be in touch with all those who replied showing an interest. Members were encouraged to consider attending the U3A Summer Schools by The Yorkshire and Humberside Regional Association at Easingwold near York, from 5th-8th August and The North West Region of U3As in Keswick from 28th-31st August. There are lots of interesting courses and friendly people to meet, not to mention one of the perks of living so close to the Yorkshire Lancashire boundary is that we are entitled to attend both! There were several notices of events with which our members have connections: Alan Fowler, our Social History Convenor and member of Hebden Bridge Local History Society is giving a talk on 13th March at The Methodist Church, Hebden Bridge entitled, ’Remembering Peterloo’. Non members are most welcome, £3 on the door. Jill Dobson is reminding us of the 4th Hebden Bridge Lecture by the Hebden Bridge Literary & Scientific Society on Saturday 2nd March, 7.30pm at The Town Hall. Richard Morris looks at Yorkshire through the eyes of artists and writers like JMW Turner, Thomas Girtin, Winifred Holtby and JB Priestly, tickets cost £10. Angela Greenwood is involved with the first Hebden Bridge Annual Film Festival and is inviting members to the launch at Hebden Bridge Town Hall on Friday 8 March at 6.30pm. Printed programmes will be available and passes & tickets will be on sale for the Festival which takes place 22nd to 24th March They can also be bought at both Todmorden & HB Tourist Information Offices & Hebden Bridge Town Hall. Melvin Coleman told us about The Calder Valley Community Land Trust which is a community benefit society and a charity so certainly not “political”. Their remit is to hold land & buildings for the benefit of the community (eg they own the Fielden Centre) and to provide sustainable and environmentally sound housing which is more affordable for the ordinary folk of the upper valley. The Trust is developing 6 bungalows at Walsden suitable for older folk. They have been working to provide 20 apartments in Hebden, particularly aimed at the 20-34 year age group, many of whom leave the area because of the lack of affordable homes. Sadly the application was very recently rejected so their important work is definitely on going. The main speaker of the afternoon was Philip Crane who took us on a whirl wind tour of his life from leaving school in Barrow, Cumbria with ‘no formal qualifications’ to Baghdad and back again. Although he started as a chef this developed into Hotel Management in the Uk and Europe, to the management of residential complexes for thousands, to catering for military staff in Iraq, via Moscow the KGB and the Mafia. He reached amazing heights and shattering lows but with the encouragement and support of his wife he not only lived to tell the tale but has written 6 novels about it too with ideas and plans for at least 4 more. A thorough and entertaining account will be available in the local press, courtesy of Ant Peters and the Chair assures the members who were unable to attend to make sure they look out for it. It will be a riveting read! 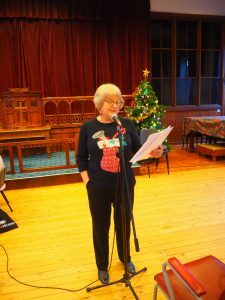 U3A Todmorden’s Christmas meeting was well served by local talent. 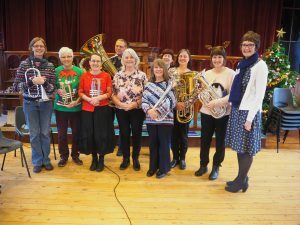 Dee Ashworth conducted the Todmorden Community Adult Learners Brass Band in a fine medley of tunes. This was TCALBB’s first outing. They more than rose to the occasion, belting out ‘Eye of the Tiger’ and rolling through ‘Out and About’, before unleashing the B flat bass on the bass line of ‘Dr Who’. This was followed by the lively ‘Hoe-Down’ and the rhythmically mellow ‘Calypso Crazy’ before winding up with ‘Bass Runner’ and ‘We Wish You a Merry Christmas’. The concert was fine example of what U3A is all about: ‘inclusion, enjoyment and pursuing interests together’. Congratulations to all participants, and to the patience and encouragement of their conductor! Those who were inspired can seize the hour and contact Todmorden Community Brass Band to get themselves going. The Five Note Band extends a warm welcome to trainee musicians of all ages. The synergy of the musicians was then translated to impromptu quiz groups who were set fiendish seasonal questions by Myrna Beet of the Quiz Group. If you knew who set up the first nativity scene in 1223 and where, or what Kenyans prefer to have for dinner on Christmas day, or what the last line of ‘Rudolf the Red-Nosed Reindeer’ is, then this was the moment for you to shine. The answer is ‘Greece’. But many of us were stuck in the political past, thinking Greece was a ‘Western’ country, when in fact we were being asked about a geographical constant. The final section was based on one of the rounds in ‘Only Connect’ – completing a sequence. Try these! Stop sign, 50p coin, honeycomb and …..? Drummers, Lords, Maids and …..? Thorn, shout, seat and …..? The winners of the quiz were Marion Kershaw, Brenda and Jim Botten, Christine Morton and Emily Watnick, a veteran of the ‘Only Connect’ competitors, The Cosmopolitans. Fine play from all the team. Gill Radford, Chair of U3A Todmorden, made several announcements, including the pleasing news that four members had volunteered themselves for committee work. Gill also hoped that Todmorden might produce its own Bake Off contestant. Any takers? 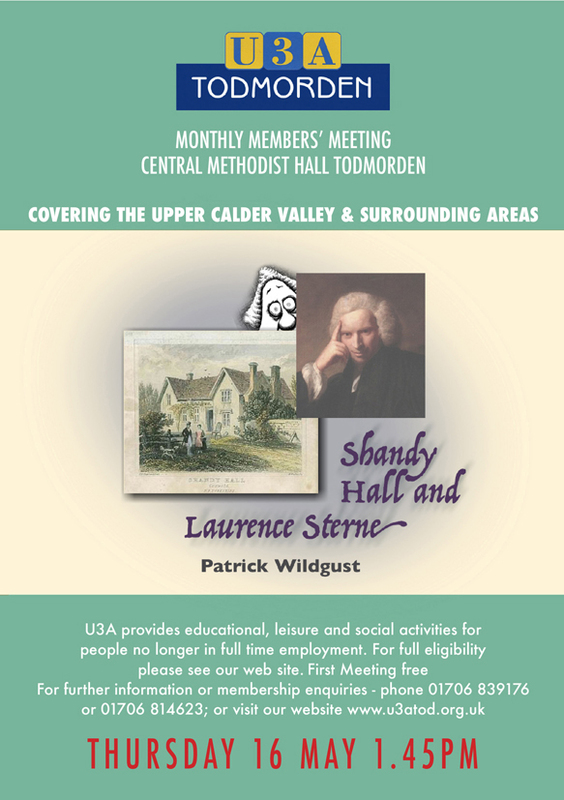 U3A Todmorden’s next members’ meeting will be on Thursday, January 17th, 2019 in the Central Methodist Church Hall in Todmorden at 1.45. We will be welcoming the return of Ray Riches and Peter Thornton who will be talking about ‘Pathways and Film Production’. Before November 15th, few members of U3A Tod would have known that a teazle features in crests on the Clothworkers’ Building at Leeds University and in the decorations of Rochdale Town Hall’s council chamber. And not many of us would have known what a teazle is. By the end of Robert McMillan’s knowledgeable, detailed and entertaining talk we certainly did. So, what’s a teazle? First, you must distinguish between the common teazle and the Fuller’s teazle. It’s the latter you need for raising the nap in clothmaking – it’s spikier and hardier. The next thing is what is a fuller? He was the bloke who trampled newly woven cloth in stale urine to help clean, degrease and thicken the cloth. After this trampling, the fuller raised the nap on the cloth by hand using teazles mounted on a handle. Then one or more shearmen trimmed the nap for a fine finish. Later this ‘teasing’ process was mechanized. Specialist workers – ‘setters’ – mounted the teazles onto ‘rods’ that they inserted into a ‘gig’, a spinning drum across which the unteased cloth was passed. Setters wore leather gloves to stop their hands being ripped to shreds. And indeed, spent teazles were used for the first passing of the cloth: fresh teazles are so sharp they rip new cloth. By this time, the significance of the teazle to our local history was plain. But it was also significant to Somerset’s history too. In Somerset, teazles were an 18th and 19th century commercial crop. Planted by broadcasting, the teazles were harvested in the plant’s second year. A maker-up then bunched the teazle stems in tens. The bunches were tied onto a stock to produce a ‘stave’. These staves were then transported to Yorkshire where sales were made, for example, in pub yards in Leeds. Huddersfield Cloth Hall was also a teazle trading centre. John Briggs advertised himself as selling ‘Foreign and English Teazles’ in Huddersfield, Milnes Bridge and Linthwaite. Nowadays, teazles are still used in woollen cloth manufacture and are imported mostly from Navarre in Spain. They are available from Border Technologies in Cleckheaton. Robert’s talk goes to show that even the most unexpected subject is interesting when presented with well-organised, knowledgeable enthusiasm. Local museums can expect a flurry of interest from U3A Tod members! U3A Todmorden’s next members’ meeting will be on Thursday, December 20th, 2018 in the Central Methodist Church Hall in Todmorden at 1.45. This is our Christmas meeting when we will enjoy Myrna Beet’s annual quiz and listen to Brass Band music provided by the Todmorden Community Brass Adult Learners’ Band. Greetings to all members. Another full house. All our usual chairs were used and the reserve wooden chairs had to be brought out, for the late comers. Our guests were Cllr Pat Fraser, Mayor of Hebden Royd, and her Consort, who both said they had enjoyed the meeting. Cllr Fraser added she would be joining U3A at the end of her Mayoralty in May. We now have a membership of 516. Gail gave her groups’ report and told us that there are likely to be three more groups shortly: Italian, Shakespeare and Novel Appreciation (group 2). Thanks to all for bringing and showing their membership cards. Andrew Teal, one of our unsung heroes, is moving shortly. Members may not see him, but we use his work every day: he is our Webmaster, and what a great job he has done for us. I am sure we all wish him well. Alan McDonald, a long- time member, has agreed to take over this role. So good news and bad news. At the last members’ meeting, I was asked if the committee had considered using “compostable” cups for our refreshments. After a month of emails back and forth to the Recycling Officer of CMBC, eventually we agreed on the type of cup we can use, which can then be recycled in the “green” bins. Cost will be £40/1000. So that’s the good news. However, looking at the list for volunteers for refreshments, there are no names from September to December. Before anyone asks, Arline and I will be responsible for August, as soon as I have completed my duties as Chairman. Please put your names down and fill the list at our next meeting. You will note from Gail’s report that we require Convenors for the Natural History and Spanish groups. We are a self-help organisation. If members don’t help, the organisation will cease. I have written to all convenors to ask for their help. Convenors are the backbone of U3A, do a great job keeping their groups fresh and alive, and give a great deal of their time. I know that within many groups, members join in, lead meetings and participate fully. However, vacancies occur and have to be filled. Our Vice Chair will be vacant at our AGM. It has to be filled, this is in our Constitution. We have a list of responsibilities for this post, which I will be delighted to forward to interested members. These are not onerous. The problem of members not volunteering runs through all voluntary organisations. Please consider carefully and if you feel that you can make a contribution, contact me or any committee member. One advantage we have is that we do not need to seek funding on a regular basis. Todmorden Town Council has given us a very generous grant towards the publication of our History project, and we are grateful. who talked about the origins and progress of their original videos and now DVDs of the Pathway Story. Intermingled with the history of this region were tales of numerous toasted tea cakes. Unfortunately their computer had a small glitch, so we were denied many photographs and films, which they had intended to show us. However, the duo were so entertaining, with asides and reminiscences, that images were unnecessary. Peter has a desire to appear in every film: like Alfred Hitchcock. Their first film was called “Walk along T’cut” and their second, surprisingly, “Walk along T’long cut.” They have produced a film about the Brontës, which they hoped would be a world-wide success and make their fortune; but no. They had many tales, and members so enjoyed their humour, that perhaps they can make a return visit. Our next members’ meeting will be on 15 March 2018. Our speaker, making a welcome return, will be Geoff Carter, and his subject; The Battle of the Somme. Also, on that day, we will have some documents from the period provided by Darren Widdup and his colleagues. Our guests will be Kate Moreton-Deakin, one of the Deputy Lord Lieutenants of West Yorkshire; Cllr Jane Scullion, Deputy Mayor of Calderdale and her Consort. Your committee look forward to meeting you. Greetings to all members and, on behalf of the committee, Happy New Year to all those who could not attend. We had a good turn out, considering the poor weather, and, excitingly, 11 new members joined! We would not really expect that sort of figure at this time of year. So a warm welcome to you and your committee look forward to meeting you. Gail’s Group report will be on the website shortly, and she advised that it is hoped there will be 3 new groups formed in the coming weeks. Myrna Beet spoke about her Quiz group, which is informal but stimulating. Teams are mixed every session and members are expected to participate by setting questions. Full details of the meetings can be found here. Looking forward to the coming year, we a great line up of speakers, thanks to Peter Carrigan. Next month, our special guest will be the Mayor of Hebden Royd, Cllr Pat Fraser. In March, our guests will be the Deputy Mayor of Calderdale, Cllr Jane Scullion, and her Consort, Mr Andrew Bibby. On that day we will offer a welcome return to Geoff Carter. I cannot delete from my memory part of his first presentation when he spoke about Antarctica and, in graphic detail, of the bird which clears up after the penguins. Geoff’s subject will be the Battle of the Somme. In 1914 a Todmorden group of men marched to Rochdale to enlist. In 2014, in their memory, a group of local men and women, replicated that march, in pouring rain. For the last 4 years, the men have attended many events and visited the WW1 battlefields. In March they will be in the Somme. Some members will attend our March meeting and bring a display of local letters and memorabilia. I sent round a news letter recently, and have to apologise. It did not turn out as originally planned. My IT skills are not great and I could not embed the u3a logo at the top of the letter. Thanks are due to Jean Pearson, Gill Radford and Marion Kershaw for their contribution. I advised that some committee members having served for 8/9 years wish to let others, with fresher ideas, take over. The situation has changed slightly. At time of writing, at our AGM, we will have a vacancy for Vice Chair; a post which must be filled. With, now 513 members, we hope that there will be at least one willing to be nominated for this role. Alison Greenwood has done a sterling job organising refreshments since u3a Todmorden started. We are seeking a member to bring a team together to provide the cups that cheer. In many u3a’s each group takes turns to provide the tea./coffee etc. With 40 groups, this would mean once every 3 years. Too big a task I ask ? Please contact me directly, if you can help in any way. Our speaker, Dr Emma Stafford, spoke about Nemesis. She explained how the perception of the Goddess changed from antiquity to the present day. From “harm no one in word or deed; do not hope for what is not allowed.” to examples of modern day Nemesis: Lord Voldemort and Harry Potter, Turkey giving Greece 12 points during Eurovision Song contest (Prof Derek Scott would approve of that example), Arsene Wenger and Sir Alex Ferguson. Dr Stafford’s students must be experts in shorthand, or have recording devices for her lectures, since she delivers at such a good pace her audience has to concentrate fully. Dr Stafford is a member of TAODS and showed the full range of her acting ability during her presentation. She kindly, produced a handout of the presentation, both in normal and large print, for which the committee are very grateful. A fuller review of this talk will appear shortly in Todmorden News. Our next meeting will be Thursday 15 February 2018 and our speakers will be Ray Riches and Peter Thornton; 2 well known local film makers. Their subject will be the Pathway Story. Your committee look forward to seeing you next month. Greetings to all members. 112 members and guests, including one very recent new member, attended our informal December meeting. If it was not possible for you to be there, well, you missed a most memorable and entertaining afternoon. After a very short welcome, I handed over to Gill Radford, who spoke about her French Improvers’ Group. This is not a beginners’ group, but is fully integrated, with all members expected to participate. The group meets alternate Mondays at the Fielden Centre. Members can, if they wish, move on to French Conversation, if there are vacancies. Welcome visitors were the Mayor and Mayoress of Todmorden. Cllr Potter spoke about her chosen charity, Age UK, and made an appeal. Age UK is about to be rebranded and will have to rely more heavily on donations and volunteers in the future. I admit that I gave a florid introduction to Ant Peter, who was acting as MC, and likened him to the late Leonard Sachs. But this was in tune with the Ant’s introduction to proceedings. Ant, in fact, embodied all the attributes, words, phrases, and eloquence of that entertainer. Members were treated to some classical and festive piano music from the multi-talented Jenny Sheldon. The first reading was given by Anthony, in a convincing Welsh accent, of a Dylan Thomas piece, about a fire at Mrs Protheroe’s, at Christmas. Arline Greenwood read the monologue about Sam and his Christmas pudding, and his conversations with the Duke of Wellington. After a mix up, Sam’s pudding was fired at the ramparts, with the result that they “blew Badajoz off the map”. Following on was Patrick Smith, a fine tenor, who sang the ditty ”Put a bit of treacle on my pudding Mary-Anne”: an old vaudeville song, full of innuendo. Our poetess in residence, Glenys Halliday, had penned a piece about “Rudolf mugging our Grannie”. How sad. Read by Ant to great effect. Keith Coates, our former Chairman, read a poem, which he claimed embodied his view of the run up to Christmas: “Grumpy Old Christmas.” The item was written by his wife, Wendy; maybe it was true! Finally, Patrick sang the Flanders and Swann favourite; ”The gas man cometh.” As he pointed out, is it possible these days to have six different tradesmen arrive, on time, in order, as required? Myrna Beet’s quiz followed. The 30-question tester was finally won after a final decider, with several teams having 26 correct answers. Peter Gibson, our Database Controller, had helped out with the launch of the biography of Geoff Love, recently. For his efforts, he was given a copy of the book, which he generously handed over, and this was won by a member, in a free raffle. The final part of the afternoon was headed by Arline Greenwood reciting the tale of Sam (again) and his failed attempts to buy a gift for a shilling in London. He finally passed the night away with the Duke, spending all his money on rum. Sylvia Hartley, in her first appearance on stage, read her very sad and modern tale of saving Mr Hassan from having his shop robbed, by hitting the miscreant with a frozen turkey leg. But this story ended with her being charged with common assault: nothing common about it she said! The afternoon was wound up by Patrick singing “Have some Madeira M’dear”, a tale of an old roue trying to persuade a young lady to partake of that drink, and his favours; and finally succeeding. All credit, applause, praise, and kudos must be given to Ant Peter, who took my original concept, improved upon it and produced a wonderful afternoon of entertainment. Ant persuaded no less than seven people to perform, and the Creative Writing Group to produce three new pieces. Thanks to all involved. The next u3a Todmorden meeting will be 18 January 2018 and our speaker Dr Emma Stafford: her subject Nemesis. Dr Stafford is Senior Lecturer in Classics, Leeds University. Hopefully we will be able to persuade her to speak for a few minutes about her interest in Todmorden Town Hall. Your committee wish you all a Happy Christmas and a safe and healthy New Year, and look forward to seeing you all during our 10th anniversary year. Thursday 16 November 2017, 11:03pm. Greetings to all members; 123 members and 9 visitors attended on a bright winter’s afternoon. We were tight for space, but the refurbishment of Central Methodist Church should be completed within a couple of weeks, so we should be able to spread out over our usual area. Doug Simpson, who has been Chairing the Accessibility Group, conducted a short survey of members who have hearing aids. 26 were present. Of these only eight knew that their unit had a switch for a loop system, and only five actually knew how to use it. U3A Todmorden has, with Doug’s guidance, purchased some connections, which run from our computer directly to the loop system in Central; thus improving the sound quality for hearing aid users. Doug also asked if anyone wished to sit closer to the loudspeakers, about 18 members indicated their preference. It has been decided that Committee will ask members to leave the front row of seats for those members with hearing issues to use. Campbell Malone spoke about the Art Appreciation Group, reminding all members that their meetings review all types of art, and potential members should not assume that the finer details of painting, only, are discussed. The meeting I attended recently was about knitting; yes, certain knitted clothing is, indeed, an art form. All members will be made welcome. The next meeting will examine the windows designed by Marc Chagall. Contact details can be found on the Group’s page of our website. Gill Radford gave the Groups report. The convenor for the German Group is moving out of the area, therefore they are seeking a new convenor. Please contact Gail Allaby if you can help in any way. 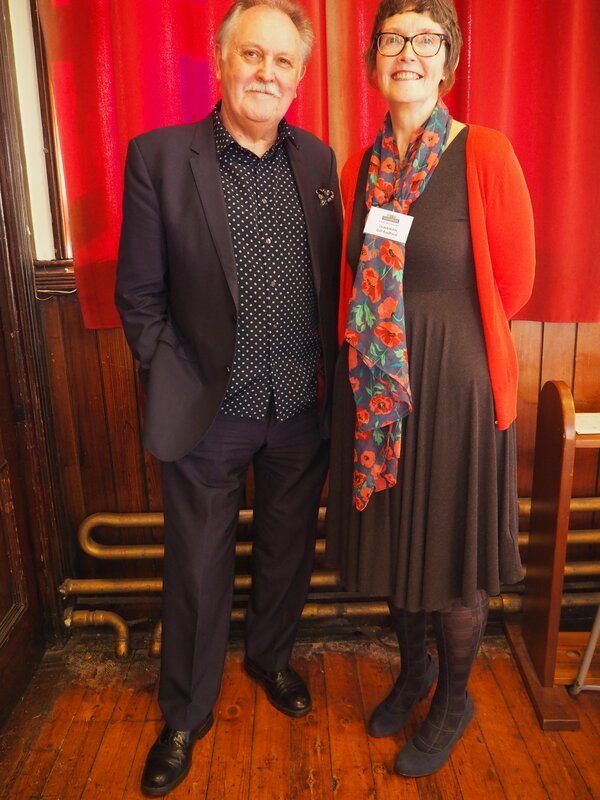 Gill then went on to welcome our speaker of the day Ian Gibson; formerly head of the Lancashire County Museums Service. Ian stepped in at the very last minute. Heather Davis, a former colleague, was due to speak, but had to attend a meeting with the Heritage Lottery Fund, to discuss a grant to help keep open five museums in Lancashire, due to close because of financial cuts. We hope she is successful. Ian’s presentation was called the “Nuts and Bolts in advances in Cotton Industry production”. Ian took us through the history of the machinery of the early years. Leonardo da Vinci had drawn a sketch of a proposed spinning machine, but Ian assured us it would not have worked; like his design for a helicopter. Hand looms have been used since 550 BC, but very few examples of the cloth of early history remain. The main problem with hand looms was the spread of the arms of the user. Some kind of machinery had to be invented to increase the width of cloth. Ian told us that William Lee used a “stocking frame knitting machine” from 1589. John Kay had an early example of a flying shuttle in 1733 and Lewis Paul was the inventor of roller spinning in 1738. Arkwright’s well known “spinning jenny”, in 1769, may not have been all his own original work. Helmshore Mill, now threatened with closure, has the only original Arkwright water frame. Ian then led us through to the present day and the speed with which yarn and cloth can be produced, and so cheaply. U3A Todmorden are grateful to Ian for giving us such an interesting presentation at such short notice. Our next meeting will be 21 December 2017, at Central Methodist Church, commencing at 2:00pm. It will be our informal Christmas Meeting, with punch, a quiz, and entertainment consisting of piano music, singing, and monologues. Your committee look forward to seeing members. N.B. I wish to thank all members who have asked about my progress following my recent surgery. Arline and I have been touched by your concern. I must thank Jean Pearson, Gill Radford and Peter Gibson, who substituted for me over the past 3 months. There were more than 50 antiques, collectibles and curiosities which members had kindly brought for Sheila to value, based on current retail prices. Sheila, a retired teacher, shows her collection at local Antique Fairs and has taken part in TV programmes such as Bargain Hunt. She was passionate, knowledgeable, and amusing as she told us that our pottery, glass, wood, paper, ivory, bone, were worth much less than we had hoped in today’s world unless they had some intrinsic quirky quality or usefulness : if it was doomed to be nothing more than an ornament the value was reduced. A snuff box in the shape of a pair of boots had a value double that of a snuff box inlaid with bone marquetry simply because of its quirkiness. Silver and gold might even only be worth their weight once melted down – what a personal disappointment! Nevertheless the audience remained spellbound for 90 minutes, many leaving with Sheila’s business cards for future contact. That is to say the hoarders amongst us could go and search their attics knowing which items had value, whilst the chuckers, like me, were left thinking, ‘Oh well, c’est la vie’! The format of the afternoon had worked well with membership cards being shown at the main entrance and everyone able to take part via the hearing loop system and the video screen which could magnify even the smallest items. Ernie Rogan thanked Sheila for her wonderful presentation. Thank you to everyone for making the afternoon a success. I was asked by the committee to take over as Acting Chairman this month in the absence of both our Chairman, Ernie Rogan and our Vice-Chairman, Gill Radford. Gill was just taking a pre-arranged, well-deserved holiday but, as many of you may know, Ernie had to have some significant medical treatment a couple of weeks ago and will be out of action for a little while yet. However, I’m very pleased to report that his recovery is going well and he seemed in very high spirits when I talked to him a couple of days ago. I’m sure that all members join with me in sending him best wishes. We had another excellent Member’s Meeting today with a very interesting talk by Trevor Moody about “Hardcastle Craggs and Gibson Mill”. This was a last-minute replacement for the advertised talk by Rev. Christine Griffiths on the topic of “Facing the Inevitable”, which had to be postponed because of ill health. 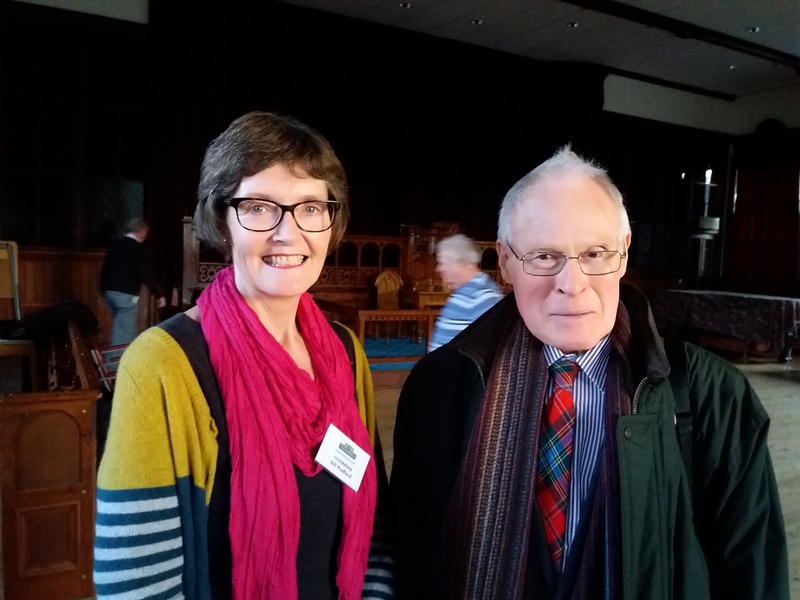 We are lucky to have the services of an excellent Speaker Finder in Peter Carrigan, and in the midst of working hard on next year’s programme of speakers, he did us proud with with such an excellent replacement today at short notice. 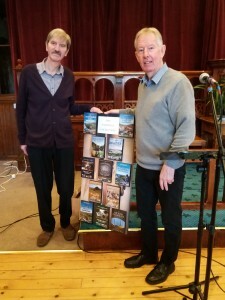 In his lavishly-illustrated talk, Trevor covered the history and development of what is now a National Trust property and included a great deal of information, not just about the Hardcastle Craggs and Gibson Mill, but also about the surrounding area. With some 200 slides and his huge amount of knowledge, I think I can say with confidence that this was definitely no second-rate substitute for our advertised event! Before the main talk, we had the usual Groups Report from Gail Allaby, albeit a shortened version this month, but full details are here, and Gail’s report will also be sent out as usual to all members on email and by post to those members subscribing to the postal mailshot. We also had another Group Showcase today, in which a different group each month is allocated a 5-minute slot to tell us all about their group – where and when it meets and what it does. This month it was the turn of the Novel Appreciation Group, and the Group Convenor, Anthony Peter, gave us an excellent insight into the group’s activities and telling us about novels they have read and plan to read in the near future. The group is at maximaum attendance level at the moment, but with four members on a waiting list there is scope for setting up a second group. Any volunteers for another Convenor? Incidentally, Anthony is the man behind the U3A press reports that grace the pages of the Hebden Bridge Times and Todmorden News, and so it was a good opportunity to thank him for the good work he does with his reports. I also want to thank George Boyle and David Sutcliffe for helping me with setting up and running the audio-visual equipment at Members’ Meetings and for standing in for me at holiday times and on occasions like today. And by the way, we’re still looking for additional volunteers to help with this work! Today’s Members’ Meeting was the first occasion when members had been asked to show their Membership Cards on arrival, and committee members were delighted by the response, with around 80% of members able to show them. We are hoping that within the next couple of months that figure will have risen regularly to 100%, thereby reducing the risk of members being turned away at the door when we make it mandatory! However, membership cards will definitely be required next month for the “Don’t Chuck It, Check It!” meeting, featuring local antiques expert, Sheila Antrobus, who will be describing and carrying out valuations on items brought in by members. In her allocated one-hour time slot, Sheila expects to be able to cover around 60 valuations! We are expecting a very high attendance at that meeting and so we are also specifying “No Visitors” on that occasion. We may even be in the position of having to turn away some card-carrying members if we find that we’ve reached the Fire Service’s designated safe capacity figure for the hall. So please come early to guarantee entrance! Doors will be open from 1.30pm as usual. Full details of how the meeting will operate were included in Tuesday’s email, but are repeated below for the benefit of new members and for recipients of the postal mailshot. Entry will be restricted to Members Only for this meeting and members will be required to show Membership Cards on arrival. To ensure that we don’t exceed the maximum capacity of Central Methodists, members will be issued with consecutively numbered tickets on arrival and if the maximum number is reached, the doors will be closed. Any member attending may bring along just ONE item for valuation. Items for valuation must be relatively small and easily portable. You will need to label your item in some way with your name and Membership Membership Number (from your Membership Card). This is for identification only – ownership of items being valued will not be announced. Members will be asked to put items for valuation on the table at the front of the room. Whilst these tables will be overseen by committee members, please bear in mind that items will be deposited entirely at your own risk. No guarantee is offered that all items will be valued – it will be up to Sheila to decide which items to feature. We are intending to use a video camera to show items being valued on the projection screen at the front. Good evening members of U3A Todmorden! 104 members (including six new members) and seven visitors attended our Members’ meeting at the Central Methodist Church this afternoon. Because our Chairman was unexpectedly unable to attend, I (Jean A Pearson) volunteered to be your Chairman for the afternoon having been given Ernie’s typed notes to read out – and I stuck to the letter – well, almost! It was a pleasure to be in the Chair for this session. In the absence of Gail Allaby (Groups Co-ordinator) I provided the following information from her – (a) she has found a new venue for our Special Interest Groups to use in the snug room at the Hare and Hounds, Burnley Road, Todmorden. The room is free, but members will be expected to buy a drink. There is a large car park. (b) The Mah Jong Group has moved from Wetherspoons and this week played at the Queen and next week the meeting will be from 3 pm – 5 pm at the Hare and Hounds. (c) The French Improvers’ Group has moved its meetings to Thursdays only. (d) Mike Hickling, who runs a bridge group at Walsden Cricket Club (Todmorden Bridge Club), has offered to teach U3A Tod members the rudiments of the game. More information will follow about days and times and insurance cover. Ernie reports that the Inclusiveness Group, led by Doug Simpson, has produced a first draft of their suggestions – a few tweaks are needed before it is published. 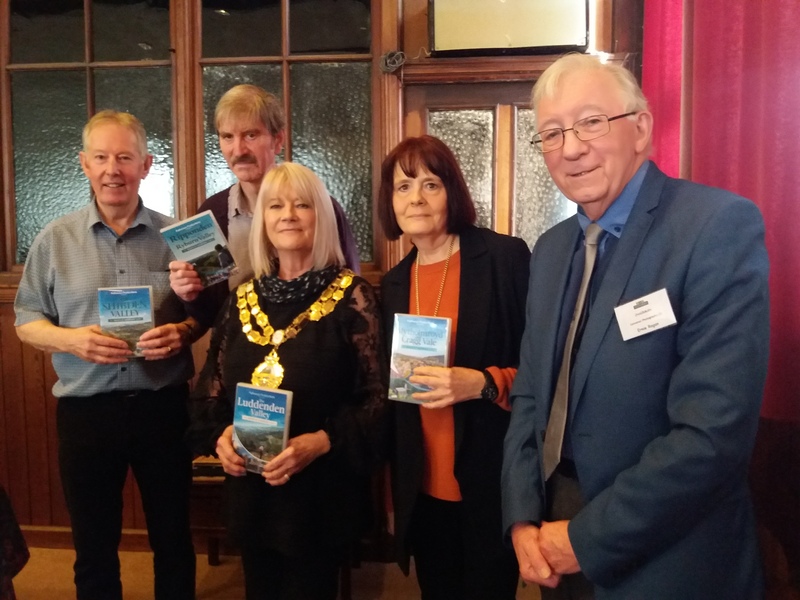 Keith Coates and his team have produced a draft copy of the ‘History of U3A Todmorden’ in plenty of time for our 10th anniversary celebrations next May. The report is about 32 pages long so it is very comprehensive and we hope to have it published professionally. A few members have not yet paid their subs and they will not be allowed to attend any Special Interest Group or members’ meetings from now on. Our October meeting will be called ‘Don’t Chuck It, Check it’, presented by Sheila Antrobus who is a valuer and auctioneer. She will be inviting members to bring along small objects – and Ernie stresses SMALL – for valuing – a sort of Antiques Road Show. We expect this to be a very popular meeting so it will be strictly limited numbers and only those members who produce their membership cards will be given entrance. Forewarned is forearmed! Membership cards which have not been collected today from Dinah Kenworthy (Membership Secretary) will be posted out by the end of September. The Speaker at next month’s meeting (Thursday, 21st September, 2017) is Christine Griffiths, who is the Minister at the Central Methodist Church, and her subject will be ‘Facing the Inevitable’. Ernie says don’t let this title put you off! If you don’t know Christine, look out for a 64 year old with either pink or purple hair and driving a huge purple Mercedes soft top vehicle – she is not the usual Methodist Minister! Mary Findon (Craft Group Convenor) gave an illuminating five-minute Showcase about our Craft Group and there was a display of some of their work prior to the meeting. The Group members sound to be full of enthusiasm and I was struck by the wide range of activities they’ve been involved in and, perhaps more importantly, the way in which they all care for and share with each other. Thank you Mary for your presentation. Our Speaker-Finder – Peter Carrigan – introduced our guest speaker – Dr Mary Holmes – the title of her talk being ‘Four years, Eight Histories and a Dog’. Her dynamic presentation gave us her reflections about her involvement in and admiration for The Royal Shakespeare Company and some of the history of its Theatre in Stratford-upon-Avon. We all found it a spell-binding talk and many questions were asked along the way. Peter thanked Mary for her talk. Greetings to all members. We had 111 members, four visitors and four new members present at our AGM and I welcome the members who joined on the day. The committee hope you enjoy your time with U3A Todmorden. The AGM ran smoothly and thanks to the whole committee for their help. Marion Kershaw read the minutes of the AGM 2016, which were accepted by the membership. Bill Griffiths gave the Financial Report, that we are in a sound and healthy position. The membership also accepted the report, which was signed and dated. Bill Griffiths is leaving his post as Treasurer. There being no other nominations Emily Watnick was returned as Treasurer. There were two vacancies on the committee; there being no other nominations Anne Foster and Peter Carrigan were returned to the committee. We now have just over 500 members registered, but expect to lose several, who have not yet paid their subscriptions. There are 40 special interest groups. The good news is that, thanks to the hard work of Emily, we now have in our bank account £445.03 returned to us from HMRC for Gift Aid. I would ask all members to consider completing a Gift Aid form, if they pay tax. By claiming back about £3 per person, we can try to maintain the £15 membership fee; held for the last eight years; and purchase new equipment. Our oldest computer needs replacing; it is eight years old and runs on Vista, which is no longer supported by Microsoft. Keith Coates is heading the Research Project and has found that there are 22 fully paid up members, whose names never appear as attending the monthly or special interest meetings. On Tuesday, Doug Simpson gave the committee a very comprehensive report on the issues surrounding members with hearing, mobility or sight problems. It was thought-provoking. We are on the right lines but work has to be done to make improvements. When the final report is given to the committee, it will be shared with convenors and interested parties. Now for several appeals. U3A is a self-help organisation, so we always require volunteers for all aspects of our groups. The team that looks after the sound and vision equipment would like some additional help. I gave full details last month. If any member has experience, or would like to be trained how to use the mixer desk, please contact either Peter Gibson or myself. Our contact details are on the website. At the end of the meeting two members came forward with offers of help. So thanks to them. We have asked regularly about helpers for the tea/coffee rota. Many members say they will help out, if required, but when asked to commit to a particular date, they seem to fade away. If you can help please contact me. To remind all members. At the beginning of September, we will post out all membership cards to those who have paid their subscriptions, but not collected them. Once a reasonable time has elapsed, members may be asked to produce current cards for entrance to monthly or special interest groups. Our Research Group found about 20 people attending groups, who were not U3A Todmorden members; this situation has mainly been resolved. Finally. We have produced newsletters reasonable frequently, to try and keep all members up to date with our activities. However, this year, those who normally put this item together have been extremely busy on projects. If any member would like to help to assemble a two-sided, simple, short newsletter, please get in touch with me. We have the processes to gather information; we require members who can bring this together, so it can be put into a “desk top publishing” program. We will then print them. At the end of the meeting a member offered to help, and for that I am grateful. But we can always use more help to lighten the workload. Gail gave her monthly report about group activities. Full information will be on the website. Jean Pearson spoke about her Art group, why it started, and showed an example of work she had completed. One of the convenors for the Lunch Club has had to withdraw and Jean Pearson has volunteered to forward details of the forthcoming meetings. Jean announced the date of the Christmas lunch. As before it will be at Stubbing Wharf and details of the date and menu are available. Book early this is always a popular event. Alison Greenwood spoke about the forthcoming weekend devoted to the life of Geoff Love and the book launch in early September. Details are available from the Information Centre. Gill Radford, our Vice-Chair introduced our guest speaker, Geoff Tansey and his presentation: Food: Wars or Peace? This was a challenging talk about fair, healthy, and sustainable food systems. Food systems correspond to what people want. But is what they want realistic, will it be so in the future? The number of people working in agriculture is staggering; about 2.5 billion, world wide, ranging from farmers, traders, workers, processors, manufacturers, wholesaler, caterers; before the product reaches us, the consumers. There is a battle for consumers by manufacturers and a few massive companies have a great deal of control. The seed industry, for example, has only three major producers. There are many threats to agriculture; climate, competition over resources, global militarisation, systems not fit for purpose. Geoff suggested that increased productivity is not necessarily the complete answer; that we already have sufficient food production for our needs. He asked in the future will we be able to consume what we want, rather than require. He suggested that we all need to act together; individuals, governments, communities, corporations, for the benefit of us all. There are some goals, the most important to end hunger by 2030. If societies do not have sufficient food, they will move. I remind members that the next U3A Todmorden monthly meeting will be on 17 August: our speaker will be Dr Mary Holmes and her subject ”Four years, eight histories and a dog”. Your committee look forward to meeting you. This is not the report of the Chairman, or even the Vice Chairman, as both are on holiday at present and so it fell to me to chair what was an exceptionally entertaining meeting. There was a short talk by Pam Lonsdale of Community Transport Calderdale who explained the range of services which they offer for those who cannot access other transport because of ill health, isolation, or simply cannot afford it. This could be for a hospital appointment or shopping. They provide a home-from-hospital service in partnership with Age UK which not only provides transport from the hospital but ensures that necessary support is available at home. The service relies on volunteers (as drivers, but also with administration and other tasks). If anyone wishes to contact them to volunteer or to find out about their services the telephone no. is 01422 845479. There is also a web site – www.ctcalderdale.co.uk. There was also a short presentation by Nigel Plant, convenor, about the photography group. He emphasised that you don’t have to have expensive equipment to take part in the group, who will welcome new members. Anyone who is interested can contact Nigel by email at nigelonline@mac.com or by phone – 01422 845479. Gail Allaby gave us the Groups Report as she has not been able yet to circulate it because of computer problems. She promised to circulate the report as soon as her computer was “out of hospital”. Our main speaker was Neil Smith, whose talk was entitled “Have guitar will travel”. An appropriate title because his talk took us from Horwich and Mecca Dance Halls in Manchester to Italy, Las Vegas, Hollywood, Saudi Arabia, Northern Ireland, Greece, South America, the former USSR, and Glamis Castle in Scotland. These are just some of the many places he has played in his career as a professional guitarist. He told how he nearly played with the Beatles before they were famous, how he played for Elizabeth Taylor, and for the Queen Mother’s 100th birthday at Glamis Castle. He also spoke of the dangers of being a guitar player, having escaped being blown up and, on a separate occasion, nearly shot in Northern Ireland; and arrested in the USSR. His fascinating stories were all accompanied by his accomplished playing of pieces which were associated with each place. It was a performance which was enjoyed by all. The next meeting is on July 20th, which will be the AGM. There are vacancies for two committee members and for the post of Treasurer. Nomination papers will be circulated shortly if you wish to propose anyone for one of these positions. Greetings to all members. We had over 100 members attending again and I welcome the six new members who joined. Our visitors included two members from the “about to be formed group” from Whitworth, Rochdale and the committee wishes them well. I am pleased to report that we now have 494 members; just short of that magic 500. Last month over half the membership renewed their subscription and at Thursday’s meeting about another 30 paid by cash and cheque, so thanks to all for paying on time. Emily Watnick, our Assistant Treasurer, has been working hard to persuade members to sign up for Gift Aid, and to date we have received from HMRC a total of £440. Hopefully there will be more to come. The not-so-good news is that Jean Pearson has been working on the Research Project and by matching names to groups, has discovered that there are over 20 people who attend, but are not U3A Todmorden members. Convenors have been given details and asked to check, and we hope this situation will be resolved shortly. As a result of this work, the committee has decided that, from September this year, members may be asked to produce their membership cards to attend group or members’ meetings. All members who have paid their subscriptions, but not collected their membership cards from members’ meetings, will receive them in the post in August. I give advanced notice that the AGM will now take place at the July members’ meeting. There will be a vacancy for Treasurer and two vacancies for committee members. The calling notice and nomination papers will be published shortly. The three projects are underway. Keith Coates has pages of information and statistics for the Research project. Many thanks to those members who have replied to the surveys. Doug Simpson is chairing the project for members with sight, hearing or mobility issues and has forwarded some of their comments. The 10th Anniversary group have met and are looking at various aspects of the celebrations. This month I was pleased to be invited to attend the Novel Appreciation group, having first read the book, Dissolution, and took part in the review of the novel. It was most interesting and I thank Ant Peter and his group. I have had a few invitations to other groups, so if convenors wish to forward dates I will do my best to attend and join in proceedings. I have been asked to remind members that there are still some places available on the Let’s Go trip to Eden Camp on 7th June. This promises to be an enlightening visit to a most well known attraction. Peter has also had the responsibility of keeping membership records. Our system is based on XL, but the committee think we should change to a more modern system, perhaps “in the cloud”. One of Peter’s other jobs has been the trouble shooter: the computer won’t start/this has gone wrong/how do I book the equipment for next week/the digital lock will not open. Any members who have worked in IT, have a love for computers and programs, are practical or can help in any way and want U3A Todmorden to continue and flourish please contact Peter, any committee member or me; all our details are on the website. Peter has carried this burden for eight years and the fact that we are asking for multiple members to take over these roles indicates his commitment to U3A Todmorden and how hard he has worked. Over the years he has been Group Coordinator, Speaker Finder, Chairman and has held other posts. Our speaker this month was Bernard Lockett and we were pleased to welcome him back. His subject this time was the Social and Political satire of Gilbert and Sullivan. Gilbert was concerned that 95% of the population lived in poverty. He talked about the corruption of the legal system. But Sullivan’s music took the edge off the satire. Members of the House of Lords “did nothing in particular, but did it well”. Many audience members could not hear the words clearly, but just enjoyed the music: fortunately, Bernard gave us numerous examples of the comments on society of their day compared with today. Disraeli gave W H Smith, who had never served in the Navy, the post of First Lord of the Admiralty, resulting in the song from HMS Pinafore “When I was a lad” “Stick close to your desks and one day you may be the Ruler of the Queens Navy”. Today known as “jobs for the boys”. As a reformer Gilbert wrote Princess Ida in 1883 and championed education and universities for women. He was truly ahead of his time. We look forward to Bernard’s next visit. Next month neither Gill Radford, vice chair, nor I will be in attendance and the meeting, Thursday 15 June 2017, will be chaired by Keith Coates, who will introduce our speaker Neil Smith and his subject Have guitar: will travel. Greetings to all members. We had about 130 members attending, but only 88 signed in. It is a “Health and Safety” matter that members sign in for the meeting. I make no apologies for repeating the cartoon, produced by Nick Littlewood and his publicity team, to remind all members that annual subscriptions are due. Members will be aware that my reports have contained many references to subscriptions. I am certain that the cartoon helped to bring this to the fore. In fact 117 members renewed last Thursday; 40% more than last year. This has resulted in having almost 25% of the membership paid up already. When the figures for those who pay by Bank Standing Order are added, on 1st May, we will have almost 50% of the membership renewed. A big thanks to all members who have already renewed, and thanks to the committee for all their hard work. We will be running a similar system, at the May members’ meeting, for those who wish to pay by cash or cheque. Members who wish to pay by Bank Standing Order can find all details on our website. It is not too late to Gift Aid subscriptions for this financial year. Bill Griffiths, our Treasurer, reminds members that the old £5 note will no longer be legal tender next month. Our 3 projects are underway. Gail and her team for the Impairment project meet for the first time next week. Any member who has hearing, sight or mobility issues, and who wishes to join, now is the time. The team planning the 10th Anniversary celebrations meets next week. Keith Coates has been leading the History and Research project, gathering statistics, information and preparing an introduction. I would draw your attention to the excellent exhibition at the Todmorden Information Centre of images taken by Photography Group 1, led by Nigel Plant. There is an immediate impact of professionalism the way the photographs have been set out and labelled. I congratulate all involved. The exhibition is on until the end of the week. A couple of weeks ago, I was invited to the Art Appreciation group to see a presentation about knitting. Though sceptical originally, I really enjoyed the experience, and learned about the meaning of the various patterns on the garments: ropes, waves, fish, boats, sailors. The co-convenor has persuaded group members to join in a trial. Members choose a number, blindly. This corresponds to a subject, and they will have to research it and give a short presentation. This is part of the process of being a member of U3A; it’s not just sitting back and listening. On to the meeting. Gail Allaby, our Group Coordinator, gave her report, which can be found on the website. It is interesting that a new group, Old English, about to start, will have an American convenor. Jean Pearson spoke for 5 minutes about the Coffee Club, which meets socially regularly. There is no coordinator, no agenda, just a general chat. Details are on the website. 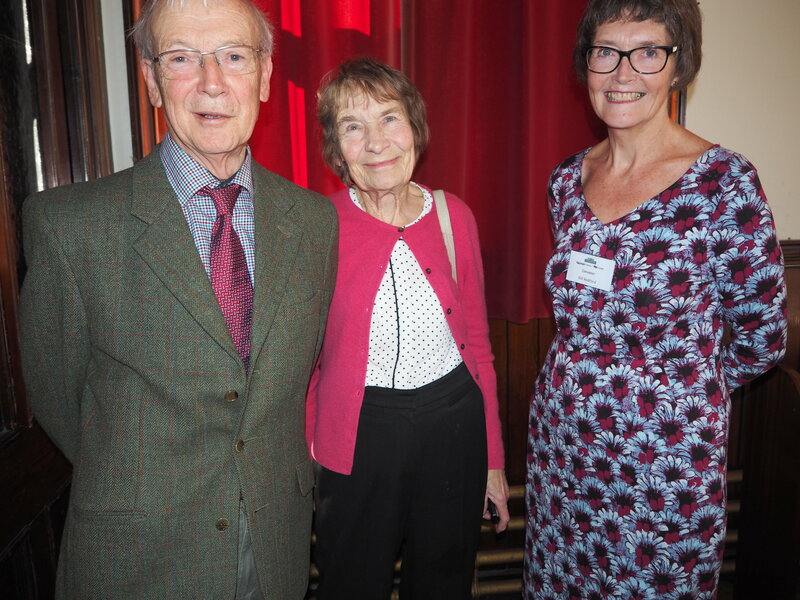 Gill Radford, our Vice Chair introduced our speaker Professor Derek Scott, for a return visit. Professor Scott spoke about the Eurovision Song Contest, which is now 60 years old. Although originally songs had to be in the country’s native language, now the contest bears no resemblance to the first years. Professor Scott gave so many examples of the various different types of songs and how they were performed. My favourite; a reggae number, “Let the sun shine into your heart”, which the singers performed wearing leder hosen. As previously, Professor Scott had us all laughing with his descriptions and treated us to many recorded highlights of the songs over the years. It was a sort of upmarket “Terry Wogan” type critical appraisal of Eurovision. I am certain we will all look forward to Professor Scott’s next visit. 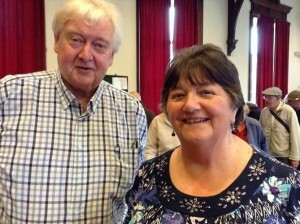 We had special guests on Thursday: Josie and Peter Conway, both from Todmorden Choral Society. I thank them for allowing us the use of the piano, which the Society owns. Our next members’ meeting will be 18 May. Our scheduled speaker has had to withdraw because of ill health. His place will be taken by Bernard Lockett, who last year delighted us with his presentation of the music of Gilbert and Sullivan. This time he will be speaking about the politics of G&S and the relevance today. Your committee looks forward to seeing you. Granville Dobson was U3A Todmorden’s Guest Speaker at our March meeting, standing in at short notice for the indisposed Alan Hemsworth, whom we had hoped would reveal The Riddle of Humpty Dumpty’. It’s always a bit of a tall order to step in at the last minute, and Granville did us proud. If the title of his talk, ‘Old Flames’, had led us to expect a naughty excursion through the love-life of his youth, Granville soon disabused us of that misconception. The old flames he had in mind were the steam locomotives he serviced as boy and man, during his time as a fireman on the footplate. Granville was 41 years with British Rail and gave us a quick resumé of the development of the railways in Yorkshire and Lancashire. He was an expert on the Low Moor Shed in Bradford. He gave us an enthusiastic run down on the achievements of railway engineer Sir William Stanier, whose engine designs brought LMS out of the doldrums and who restored the Low Moor Shed. He also reminded us of a few key railway dates: 1948 nationalisation; 1958 Low Moor shut to steam engines; 1959-1964 dieselisation at Low Moor; 1963 and 1965 The Beeching Reports; 1966 closure of branch lines all over Yorkshire; and 1967 – the closure of Low Moor Shed. Granville had a lot to say about the bitterness between ASLEF and the NUR, and even more about Ernest Marples, then Minister of Transport, whose road-building interests just happened to coincide with Dr. Beeching’s recommendations for closing rail lines. Unsurprisingly, Mr Marples ended up living abroad. But Granville’s personal recollections were given equal weight in his talk. He described his affair with rail as ‘hot, dirty, uncomfortable, dangerous and wildly exciting’, especially as a fireman with one foot on the loco and one on the tender. In 1946 as a boy on a visit to London, he was invited into the cab of a Stanier Pacific locomotive called ‘City of St Albans’ and consequently, when he left grammar school, he felt called by the romance of rail rather than a white collar job. As a beginner he was on £5-17-00 a week. That earned him the privilege of cleaning out the fireboxes, chipping out razor-sharp ‘cabbages’ of clinker. He used a spanner as a hammer and at the end of the day he went home covered in red dust. There were no washing facilities at work. When he was able to, he applied to be a fireman, was accepted, and worked his way up to mainline operations. He operated under many different drivers. One, Jack Crampton, had the reputation of burning more coal than any other driver in the region, but though incompetent was generous. Harold Leroy had an explosive temper and disliked graduate managers. Another colleague, who was a maniac when trying to make up lost time, once refashioned his false teeth by the heat of the firebox because they fitted badly, only to discover that they were his wife’s. Health and safety was different then, too. A badly bleeding finger was something to wrap up and put up with as you shovelled coal – no fun if you were on a line with 43 stops and the engine needed a constant supply of fresh steam. This was an immensely enjoyable talk, and our appreciation was shown by Granville (who never had time to cook bacon and eggs on a shovel) selling all the copies of his book he had brought in case of interest from our members. 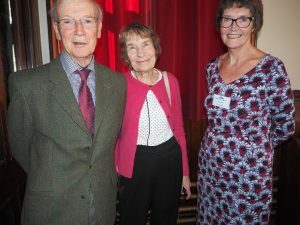 A new feature for our U3A groups, this month it was the turn of Jazz Joy, and group convenor David Greenhough spoke about Jazz, the love of his life. David owns 20,000 vinyl jazz records, all a consequence of hearing Big Bill Broonzy at an impressionable age. For £2 a session, to cover room costs at the Fielden Centre, members can enjoy a couple of hours of unadulterated pleasure in the company of both jazz and the intensity of David’s measured, knowledgeable and humorous enthusiasm. Ernie Rogan also urged us to pay our subs as soon as possible, and to consider seriously the advantage of doing so by standing order. And we were reminded that by Gift Aiding our subs, U3A can claim free money from HMRC. Finally, members will be pleased to know that several convenors have attended a First Aid course run by Don Buxton, a Yorkshire Ambulance responder, and are now more confident about handling a crisis should one occur. Our next meeting will be held on Thursday, 20th April in the Central Methodist Church in Todmorden at 1.45 when our speaker will be Professor Derek Scott, whose subject will be ‘Eurovision Song Contest’. Our contact details are (website) www.u3atod.org.uk, (email) enquiries@u3atod.org.uk, or (phone) 01706 812015. Members’ meeting report, Thursday 16 March 2017. Greetings to all members. We had a good attendance of about 100 members. Gail gave her group report, which can be found on the website. Committee member Peter Gibson made an excellent suggestion, agreed by the committee, that convenors could have five minutes to promote their groups. The first to speak was David Greenhough, convenor of Jazz Joy. David has huge enthusiasm for his subject and a great commitment for his group. He lives in Bacup, does not have a car and so ‘commutes’ to his meetings by taxi. I hope that David’s dedication is rewarded by an increase in the attendance at Jazz Joy. Full details of meetings can be found on the website. A great effort from Emily Watnick bringing to the attention of members and the committee the subject of Gift Aid has resulted in 140 members signing up. This will result in U3A Todmorden receiving from HMRC about £500. I would ask all members to consider Gift Aid. Members who pay more than £3.75 per annum tax are eligible to sign for Gift Aid for U3A Todmorden. This will help retain the membership fee at £15 and/or help us to renew our equipment as required. Next month the committee hope to begin a campaign to ask members to consider paying subscriptions by Standing Order Mandate. The form for year 2017/18 is already on the website (thanks are due to Peter Gibson and Andrew Teal), to ensure we are ready in plenty of time. If any members not on the net wish to have a SO, then please contact me and I will ensure that one is posted. The Memory Day was well received by those attending and the feedback was good. The Impairment Project will be led by Gail Allaby. Any member who has issues with sight, hearing, or mobility and who wishes to increase their enjoyment of membership of U3A Todmorden should contact Gail. Keith Coates, our former Chairman, has produced a questionnaire for our History and Research project. We intend this to be published by March 2018, in time for our 10th anniversary. A sub-committee has been formed to organise the celebrations. Our speaker Granville Dobson, came to our aid. Our booked speaker became ill on Tuesday and Granville agreed to give a presentation. My thanks to Peter Carrigan for his hard work in finding a speaker, and to Granville for stepping in at such short notice. Plans have been made should a similar situation occur. Granville talked about his 41 years on the railway, focusing on his 15 years as a Fireman, on the footplate. His home base was Low Moor, near Bradford. In 1948 the rail network was nationalised and by 1964, except for excursions, all trains were diesel hauled. Granville started work, at 16, as a junior cleaner, which meant climbing into the fire box of steam engines. He never knew how hot the working environment would be. He had to clear the clinker from around the inner skin and this always resulted in a choking red dust forming, within minutes of starting work. The fire boxes were approximately 10ftx5ftx5ft. There were many tales of the trials and tribulations of working on the footplate and the characters with whom he worked and spoke about very fondly. He talked about a driver, whose false teeth did not fit correctly, so spent a quite while carving and moulding them into shape. Only to find they were actually his wife’s! Finally, on Saturday 18 March, 14 convenors attended a First Aid Awareness course, receiving an overview of First Aid including resuscitation, presented by a Yorkshire Ambulance responder. I thank Anne Foster for arranging the course. I am certain that all who attended will feel a little more confident, should a situation arise. Our next meeting will be on Thursday 20 April, when Professor Derek Scott will talk about the Eurovision Song Contest. Members may recall Professor Scott giving a humorous presentation last year. Your committee look forward to seeing you. Greetings to all members. We had our best attendance ever with over 150 members at Central. In fact some were so eager they were, literally, banging on the doors. Our Group convenor, Gail, is on a well deserved holiday, so I would ask all members to look at her on-line report. There were two matters of concern. 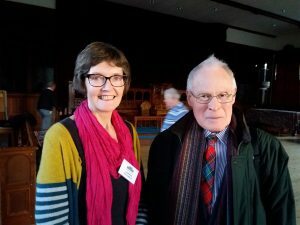 Doug, who has been the Convenor for the World Affairs group for many years, reported that unless a volunteer could be found to take over the running of the group, the February meeting would be the last one. At the eleventh hour, Peter Baron has stepped forward and I thank him. As members were advised last month, there were no volunteers for making refreshments, so we were without our usual welcome cup of tea/coffee and biscuit. However, Alison has advised that several members had “signed up” and, hopefully there may now be just sufficient for the remainder of the year. Emily Watnick, our Assistant Treasurer, has brought her valuable experience to remind our members to sign up for Gift Aid. In general, members who pay tax can sign a simple Gift Aid form. This allows U3A Todmorden to claim back £3 on top of every £15 subscription. 22 members signed the forms on Thursday and we now have a total of about 70 members. This means that we can already claim over £200 back from HMRC. This could result in the group retaining the subscription at the present level of £15, or helping purchase equipment in the future. Ideally, the committee would like all eligible members to sign for Gift Aid. The £200 we can reclaim now is equivalent to 14 new members joining; and we do not have to service them; no emails, correspondence, or postage. Last year the committee had difficulty in collecting subscriptions. These are due from April, yet some members did not pay until September. This, I believe, is unfair for the rest of the membership. We will be, actively, encouraging members to pay by Direct Debit. The Impairment project has only 6 members who wish to be involved. This project’s aim is to enhance the enjoyment of members who have issues with sight, hearing, or mobility by making suggestions for improvement. Before we go any further, if any member wishes to join in, please contact me. 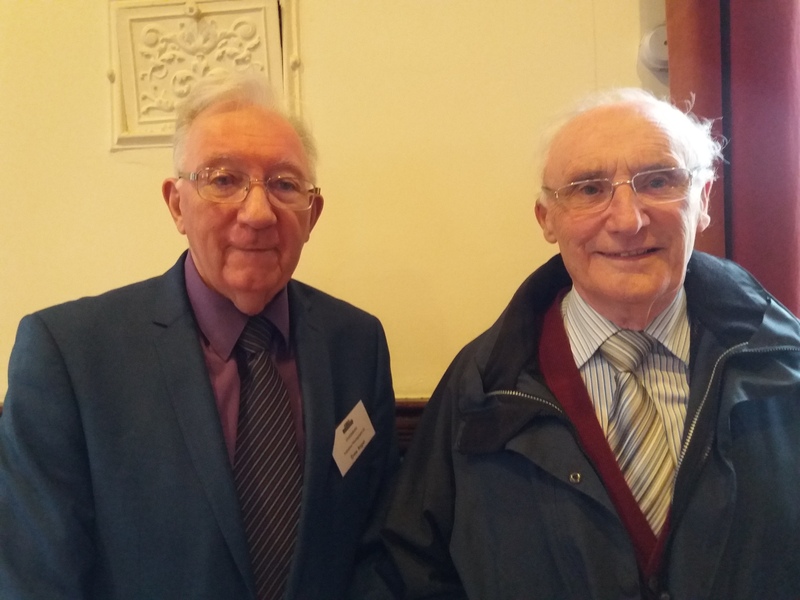 2018 will be the 10th anniversary of U3A Todmorden and, to celebrate, Keith Coates, our former Chairman, will introduce a combined History and Research project. We would like to speak to the original 50 members, most of whom are not only still around, but active. 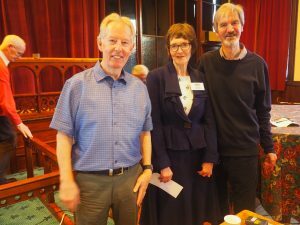 Our speaker this month was Maria Glot and her subject was Titus Salt and Saltaire. Maria was the first Tourist Officer of Bradford District and now runs the Saltaire Experience, also acting as a guide. Her presentation was “in character” as the wife of one of Titus Salt’s employees: “eight children and another on the way”. Titus Salt built Saltaire Mill and the surrounding town, to be away from the slums and pollution of Bradford. The housing he offered his workforce was better than anywhere else in the area. Rents were not cheap, but the houses had indoor toilets and running water. There was a cost: hard work in the mills, long hours, six days a week. He was an excellent money maker, even utilising every waste product to advantage. He patented a machine which could turn alpaca fibres into cloth which was as soft as silk, but cheaper. Opinions differ about him: Philanthropist or Tyrant; 150 years on, we are no wiser — he burned all his papers prior to his death. 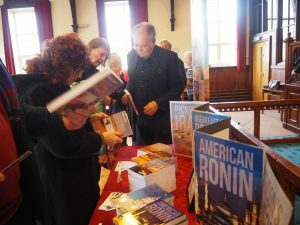 Please look out for a full review of Maria’s presentation, by Ant Peters, with photographs from J Roger Howard, in Todmorden News, in the next four weeks. Our next Members’ Meeting will be Thursday 16 March and our speaker will be Alan Hemsworth; his subject, the Riddle of Humpty Dumpty. Greetings to all members. Your committee hopes that this year will be an exciting one for all members, with our three projects. Our Memory Day is now fully booked, with a small waiting list. There will be a full report in February. The History and Research project will be launched, next month, by our former Chairman, Keith Coates. Keith will give full details at our February meeting. This month we launch our “Impairment project”. We would like members with hearing, sight, and mobility issues, to form a working group. We would like the group to look at what they think we, as a committee, could try to do to improve their experience of U3A Todmorden; to look at possible solutions, costs, sourcing, and then advise committee so that we can, hopefully, put these benefits or improvements into place. I would ask any interested member to pass on their name to our Group Co-ordinator, Gail Allaby, at g.p.allaby@allaby-cook.co.uk. We are pleased that John Taylor, Chairman of the Blind Society and also Todmorden Talking Newspaper has agreed to offer his help. We have received a card from Dementia Friendly Todmorden, thanking those members who knitted “twiddlemuffs”, which are now being donated to local Care Homes. The Town Council is running a series of Workshops for the Todmorden Neighbourhood Plan: Future Key sites; Future of Housing; Local Infrastructure. Full details are in this week’s Todmorden News or can be obtained from the Town Council. Some not so good news. We do not have any volunteers for refreshments for the next four months. Therefore, unless members step forward, there will not be any tea/coffee/biscuits at the start of our Members’ meetings until June. Any volunteers should pass their names to Alison Greenwood at ali.greenwood48@gmail.com. Four new members joined this month and on behalf of the committee we welcome them. Our guest speaker Alun Pugh gave an interesting presentation about his father Dei and his service in Bomber Command during WW2. Alun told members of his father’s determination to be a pilot, about his training in Canada, although being told initially that he was too tall. Alun read extracts from his father’s diaries, recounting the operations he carried out. In 1944, a day after completing his dinghy training and following a raid on Berlin, Dei had to ditch into the sea, with his crew, and regrettably several members drowned or died of exposure, leaving only two crew members alive. Although a serious subject, Alun managed to inject humour into his presentation. To remind members, our next meeting will beon Thursday 16 February 2017, when Maria Glot will be speaking about Titus Salt and Saltaire. Your committee looks forward to seeing to next month. Chairman’s report on the members’ meeting, 15 December 2016. Greetings to all members. This report will be quite long; some light reading over the festive period. My week started listening to Eric Midwinter, on You and Yours, talking about the growth of U3A. 35 years earlier the programme had championed U3A. Now we have 1001 groups and 384,000 members and still growing. I am proud to be a part of this excellent organisation. There was a smaller than usual attendance at our Christmas meeting. We welcomed our Town Mayor, Cllr A H Greenwood, also a U3A Todmorden member, and his Mayoress. Our entertainment was provided by our quiz team, ably led by Myrna Beet, who provided a variety of questions; general knowledge, music, pictures. Many thanks to them for their hard work. John Wallis gave us a short history of Variety and Music Hall, originally called Harmony Meetings, which started in the East End of London and were for males only. John then went on to talk about his favourite “daft humour”: mainly Northern. He spoke about George Formby, who made 22 films, and many other Northern comics. John told his favourite jokes and regaled us with his expertise on the tenor banjo, mandola and ukelele. Finally we joined John in traditional songs and ended with a good sing-a-long with Christmas Carols. Next year we hope to offer members some projects. Firstly will be a Memory Day on 22 February and this is detailed below. Early in the New Year we hope that Keith Coates, our former Chairman, will lead a research project. U3A Todmorden will be ten years old very shortly, and we would like to start a History of the Group. We will write to the members who joined first, the original steering committee and committee members, asking them for their memories. We will hope to build on this and find out about our membership and compare it with our local population. Keith will give details on his return from the USA. Finally, we would like a working party formed by members who have impairments; hearing, sight and mobility. The committee would like them to look at what is required to improve their experience of U3A; to try and find possible solutions, and costs, and then advise committee to see if funds are available. There will be more details in the New Year. I thank all committee members for their hard work this year and wish all members a Happy Christmas, a safe and healthy New Year, and that we can all meet again in 2017. We have arranged for a Memory training day to be held at Central Methodist Church on Wednesday 22 February 2017, from 2.00pm to 4.00pm. 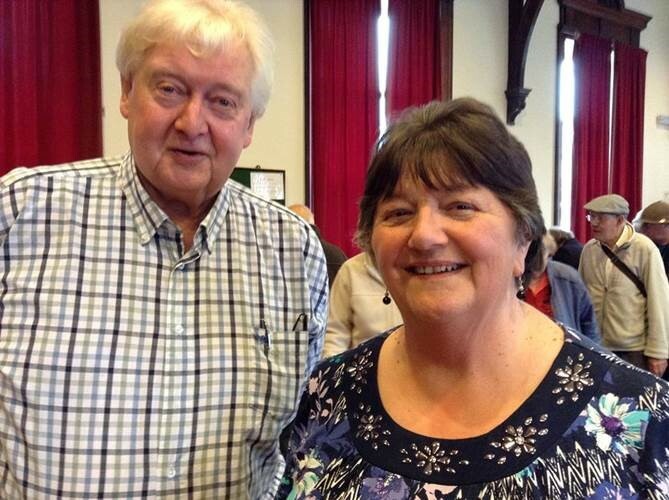 The presenters will be two members of Heswall U3A. The first 70 minutes will be details of how the brain works, followed by hints and tips of how to train the memory. We will then have a short refreshment break and continue with a period of interaction and practice. We can only have 20 members per session, so it will have to be on a first come basis. There will be a charge of £5 per person to cover expenses. Members who are interested should contact me either by email: arlineandernie@tiscali.co.uk or telephone 01706812015. If the event is successful and there is sufficient interest, we will try and arrange another session later in the year. Chairman’s report of the members’ meeting, Thursday 17 November 2016. The committee is grateful for so many members attending on what was, in the morning, promising to be a typical miserable winter’s day. We welcomed committee members from U3A Littleborough and announced that we now have signed a reciprocal agreement. Members can attend interest groups at either U3A with the usual proviso; checking with the convenors that vacancies are available and paying the group fees. Contact can be made via the website: u3asites.org.uk/littleborough. Our short talk was given by Daniel Jessop; Volunteer and Events Coordinator at Todmorden Town Hall. Daniel has spoken to U3A Todmorden previously, making a successful appeal for volunteer guides. 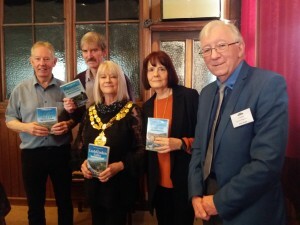 This time Daniel talked about the new Todmorden Town Hall guidebook: “reasonably priced at £4.95 and published just in time for Christmas.” I may have paraphrased his words. All the research was undertaken by the Town Hall guides, spending many hours in libraries and searching files. The guidebook was actually put together by Emma Stafford, Senior Lecturer in Classics at Leeds University. Her story in itself is interesting. A member of Todmorden Choral Society, she spent so much time admiring the medallions on the ceiling, she sometimes almost forgot to sing. Our main speaker was Alan Fowler, a member and convenor of the Social History group. His topic: The Cotton Factory Times cartoons, by Sam Fitton, of WW1. Or “What did you laugh at in the Great War Daddy?”. In 1914, the immediate impact of the war was unemployment; followed by part time employment. In 1916 prices and wages doubled, with wages chasing prices. There was the difficulty of recruiting personnel, so many men having gone to join the Armed Forces. Women began to work in the Cotton Industry; for the first time in spinning. The “u-boat” menace led not only to a shortage of food, but also of cotton, the raw material. Egyptian cotton was available, but the industry relied mostly on cotton from the USA. Alan explained all the symbolism within the cartoons; the nicknames of the Kaiser, those profiting from the war, and the social effect of paying the cost of the war. In 1914 the Cotton Factory Times consisted of 8 pages. By 1917 it was down to 4. Sam Fitton’s cartoons only appeared in the inside pages and so were stopped. Our next meeting will be on Thursday 15 December featuring our well known non alcoholic punch, a Christmas quiz designed by Myrna Beet, and entertainment provided by John Wallis. Your committee look forward to meeting you at this relaxed event. Chairman’s report of the Members’ meeting, 20 October 2016. What an afternoon. 148 members and visitors attended on a warm autumnal day. We had nine new members join U3A Todmorden. Keith Coates, our previous chairman, gave the group report, Gail Allaby being on holiday. This was followed by our main speaker, Bernard Lockett, and his talk on the Musical Theatre of Gilbert and Sullivan. And what a wonderful presentation he gave. It was full of facts, humour, anecdotes and interspersed with clips from various performances. We learned about the lives of the duo. In 25 years they wrote 14 shows. Few other collaborations have been as productive. They were both equally important, Sullivan’s music complementing Gilbert’s words. Their first show, Thesbis, was a failure, but now G&S rank second only to Shakespeare for the total number of performances. In fact Mikado is the most played theatrical piece. Arthur Sullivan also wrote hymns and received a knighthood for his services to music. Whereas W S Gilbert, who wrote the lyrics, so infuriated the “establishment” by his criticism that he was honoured only for his work as a Magistrate. The vote of thanks was given by Peter Carrigan, our Speaker Finder, who has revealed the exciting list of speakers for the first six months of next year. The list will be published shortly. Our speaker next month will be our own member and convenor of the Social History group, Alan Fowler. His subject will be the Cotton Cartoons of the Great War. NB: The International G&S Festival will take place in Harrogate between 4 and 20 August 2017. Found: A small blue zipped case containing a pen and 2 tuning forks!!! If the owner could drop me a note (joke) to arrange collection. Vice Chair’s report of the Members’ meeting, 15th September 2016. Two new members joined 87 other members and 11 visitors, on a warm day, for our September meeting. Gill Radford introduced herself as the new Vice Chair and fronted the meeting in Ernie’s absence. Gail Allaby gave her groups report, which was followed by a promotion by Richard White for a meeting at Hebden Bridge Town Hall, 9th October, to discuss safety; a notion highlighted in the recent Brexit discussions of which people seemingly do not have a common view, hence the meeting to discuss. Our main speaker, Steve Halliwell, followed. His subject: Moses Holden; Astronomer, Lecturer and Methodist Evangelist. This was an informative and interesting account of the life and works of Moses Holden, born 1877, the son of a hand loom weaver who became Freeman of the Borough of Preston. A self-educated genius who learnt to read at Sunday School, he was determined to become an astronomer after listening as a child to stories by Jeremiah Horrox. He founded in Preston The Institute for the Diffusion of Knowledge which, working closely with the Temperance Movement, followed the blueprint of The Mechanics Institutes which were springing up in the surrounding towns. He was a non-ordained Methodist Minister who completed an 18 month evangelical tour of the Fylde, leading Sunday School and Bible Group classes. This allowed him to fine-tune his skills as a public speaker and in turn he became a lecturing astronomer, talking about the telescopes, microscopes, clocks and magic lanterns that he had made. Touring the northern towns he lectured to audiences demonstrating his mathematical genius. He produced a transparent Orrery, and ultimately wrote a Celestial Handbook and Almanac featuring charts of planets, stars and comets, including, of course, Halley’s. Moses Holden is mentioned on the Founders’ stone at the University of Central Lancashire, an accolade which exemplifies his life’s work in Preston and the surrounding area. After responding to questions from members, Steve Halliwell was pleased to make available signed copies of his book. Our next meeting will be on Thursday 20th October when our speaker will be Bernard Lockett and his subject: The musical theatre of Gilbert and Sullivan. Chairman’s report members’ meeting 18 August 2016. Four new members joined 86 other members and 12 visitors, on a warm day, for our August meeting. Some two dozen members have still not renewed their subscriptions, so at the end of this month they will no longer be members of U3A Todmorden and will not be able to attend any group activities or events. Our Treasurer, Bill Griffiths, still requires an assistant. Would any interested member please contact Bill or myself; we will welcome any calls. A plea from member Joan Bentley. Joan handed over a poetry book, in March this year, and cannot remember to whom she gave it; a small red hard backed book by Dr Fitzroy Gregory Joseph. If anyone has the book, please contact me. Gail Allaby gave her group report, which was followed by our main speaker, Lesley Wood. Her subject: Chocolate – past, present and future. This was an interesting and very detailed account of the history of chocolate to the present day. Chocolate beans are grown in an area only a few degrees north and south of the Equator. The trees take about 4 years to mature and are “pollinated” by biting midges. Traces of chocolate have been found in pots as old as 3000BC. In some cultures chocolate was used, specially, for betrothal and marriage ceremonies. Mayans used it as currency, perhaps leading to the expression “money grows on trees”? Originally chocolate was taken as a drink. 70% of all chocolate now originates in Africa and some three million tonnes are produced annually. The three types of beans are blended together to give the best taste. Cocoa butter is used to make milk chocolate which it took some 15 years to perfect. On the first evening of ITV, the biggest adverts were for chocolate products. Lesley told her audience that there is great concern about the amount of rain forest land being devastated for the growth of cocoa trees. Our next meeting will be Thursday 15 September, when our speaker will be Steve Halliwell, and his subject: Moses Holden; Astronomer, Lecturer and Methodist Evangelist. Chairman’s report members’ meeting 21 July 2016. 83 members and visitors decided not to top up on their Vitamin D and attended our July meeting. The first few minutes were dealing with an EGM, at which Gill Radford was confirmed, unopposed, as Vice Chair for U3A Todmorden. The committee welcome Gill and look forward to her participation. Gill is a convenor for French and German and will, in September this year, become Mayor of Luddenden Village. Our Treasurer, Bill Griffiths, still requires an assistant. Hopefully there is a U3A Todmorden member who has experience with financial matters and a little time to spare. Bill or I will welcome any calls. Our subscriptions for 2016/17 were due on 1 May 2016. Some members have not yet renewed. In accordance with our constitution “the committee may and for good reason terminate the membership of any individual if annual membership is unpaid 3 months after the due date“. This would mean not being able to attend any U3A Todmorden groups or events. I urge all members who have not yet renewed to do so by 31 July 2016. Our main speaker, David Gilman, gave a fascinating presentation about his trips in the last two years, during which he participated in building a house in Palestine and a community hall in Guatemala. David described how he and about 20 other volunteers acted as labourers to help build a duplex building in Palestine, which now houses five families and 20 children. In Guatemala the building was constructed by filling bags with earth, pounding them down and then securing using barbed wire. All volunteers had to pay to be part of the projects, run by the Amos Trust. A collection was taken at the end of the meeting and £89.06 raised. Another of our members, Fyfe Sainsbury, followed with an impassioned plea on behalf of the Hebden Bridge Cinema. Flooded in December, the building soon reopened and has been refurbished to a high standard. However, since the floods, attendances have been down. The Cinema is an asset to the local community and features opera, ballet and live shows. Fyfe hopes that the publicity will help swell the audiences. Jean Pearson, our former Chair, gave the Groups report, Gail not being able to attend. Our next meeting will be Thursday 18 August, when our speaker Lesley Woods will give a talk on Chocolate – past, present and future. Greetings. The AGM was organised excellently by Keith Coates, the outgoing Chairman, and Marion Kershaw was returned as Secretary, Dinah Kenworthy as Membership Secretary, and Ernie Rogan became Chairman, there being no other nominations. So, I am privileged to be the 7th Chairman of U3A Todmorden. Keith has written some words about his 2 years in office. These are attached. Keith has steered a straight course for us the last couple of years and the thanks of the committee go to him for his sterling work. Our membership now totals over 460. Fortunately Keith has agreed to to remain as a co-opted member of the committee, so we will not lose his expertise and experience. Leaving the committee are Margaret Gunnill, our former Membership Secretary, Liz Hurst, who has been helping our Treasurer, and Jean Pearson, a long time committee member, former Vice Chair and Chair. We will miss their valuable contributions. We now have a vacancy for Vice Chair and a nomination form and details are attached (for return by July 7th). Our speaker today, Dr Frank Nicholson gave us a fascinating and detailed presentation into the difficulties of mining ore in Canada. The permafrost causes great problems, as does working in temperatures of minus 15 and below. Dr Nicholson described the growth of the town of Schefferville, around which were huge deposits of iron ore. At its height over 12 million tonnes of ore were mined every year. On behalf of the committee, thanks to all members for their participation this year and we look forward to the new challenges ahead. Our next members’ meeting will be on Thursday, 21 July, when David Gilman will be speaking about “Volunteer building projects in Guatemala and Palestine”. Prior to the Members’ Meeting an Emergency General Meeting will be held to elect a new Vice-Chair. Here is the second issue of the Newsletter. Once again I must thank Jean Pearson for putting it together with assistance from Christine Richmond. We had another well attended meeting this afternoon. There were about 130 present, including 4 visitors. Our speaker was Gill Russell, who is the Chairman (the term they use rather than Chair) of the U3A North West Region Executive Committee. However, she wasn’t speaking to us about U3A, but about being “A Stranger in a Strange Land”, the strange land being Japan, where Gill and her family lived for 4 years and which she has recently revisited. It was a fascinating and informative talk which emphasised the juxtaposition of traditional culture and the ultra-modern in Japan with many illustrations. The talk was very well received and clearly captured the imagination of many which was, perhaps, demonstrated by several members speaking to Gill afterwards about the best way to arrange visits to Japan. The World Affairs group are holding a special meeting on Wednesday June 8th at 2.00 pm at Roomfield Baptist Church, Halifax Road, which is open to all members. There will be a charge of £1 to cover room hire. The aim is to inform and educate members about the EU and the UK in advance of the forthcoming referendum on UK membership of the EU. There will be no speeches for or against leaving and no vote. There will be a series of short presentations by members of the World Affairs Group on a number of topics. The topics are still being developed and the provisional list below may change. What have we got for our EU membership? After each topic presentation there will be a short opportunity for questions, but not for speeches expressing opinions. The presenters do not guarantee to answer the questions, as they may not know the answers. The next meeting on Thursday June 16th is the AGM. Notice of the AGM and Agenda are linked here . It will start at 2.00 pm and will be followed by the usual monthly meeting with a guest speaker who will be Dr. Frank Nicholson. He will be speaking about “Living in the Canadian Sub-Arctic”. One of the items at the AGM will be election of Officers and Members of the Committee. This year there are three vacancies for : Chairman : Secretary : one Committee Member. If you are interested in any of these positions, or you wish to nominate another member, this Nomination Form has to be returned to the Secretary by June 2nd.